CARFAX 1-Owner, GREAT MILES 30,381! FUEL EFFICIENT 29 MPG Hwy/19 MPG City! iPod/MP3 Input, Satellite Radio, Onboard Communications System, WiFi Hotspot, Dual Zone A/C, Rear Air, ENGINE, 3.6L DOHC V6 DI WITH VARIABLE... AUDIO SYSTEM, CHEVROLET MYLINK RADIO... Alloy Wheels READ MORE! Rear Air, Satellite Radio, iPod/MP3 Input, Onboard Communications System, Aluminum Wheels, Dual Zone A/C, WiFi Hotspot. MP3 Player, Remote Trunk Release, Keyless Entry, Child Safety Locks, Steering Wheel Controls. CONVENIENCE PACKAGE includes (UD7) Rear Park Assist, (UVC) Rear Vision Camera, (DD8) auto-dimming inside rearview mirror, (BTV) remote vehicle starter system, (UG1) Universal Home Remote, (B58) premium carpeted front and rear floor mats and (B36) carpeted trunk mat, AUDIO SYSTEM, CHEVROLET MYLINK RADIO, AM/FM STEREO WITH CD PLAYER (STD), TRANSMISSION, 6-SPEED AUTOMATIC, ELECTRONICALLY-CONTROLLED WITH OVERDRIVE (STD), ENGINE, 3.6L DOHC V6 DI WITH VARIABLE VALVE TIMING (VVT) (305 hp [227.4 kW] @ 6800 rpm, 264 lb-ft of torque [356.4 N-m] @ 5200 rpm) (Includes E85 FlexFuel capability with (FE9) Federal emissions or (YF5/NE1 and NC7) California emissions with the Federal override only.) (STD). Chevrolet LT with Champagne Silver Metallic exterior and Jet Black interior features a V6 Cylinder Engine with 305 HP at 6800 RPM*. Non-Smoker vehicle. Edmunds.com`s review says A generous wheelbase gives the Impala serious passenger space front and rear. 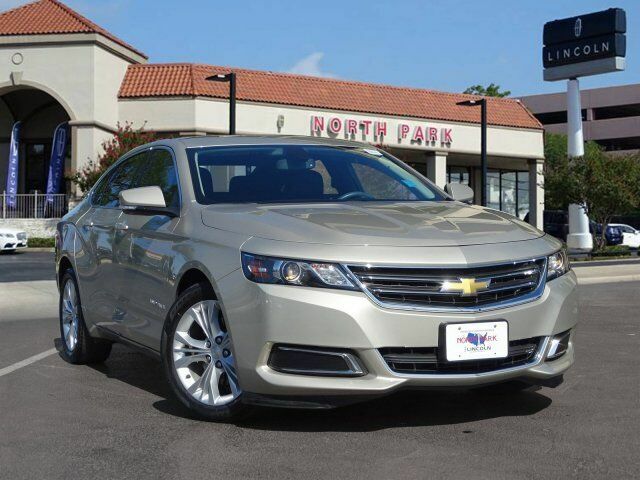 Four 6-footers could do a cross-country road trip in perfect comfort; that`s what we expect from a large sedan, and the Impala certainly delivers.. Great Gas Mileage: 29 MPG Hwy.